What I liked most about this M3 is that it gives you the option to choose the modes of Swap, Chain, or Group, DURING GAME PLAY!!!! You can actually change the mode, as many times as you like, while playing the game. I enjoy Groups, but to get to all the tiles, I needed to switch to Swap. The power-ups are plentiful and powerful, and there are plenty of 'obstacles' put in your way as well. There are mini games in between that give this cute and colorful game a lot of variety. I could play this for hours on end! 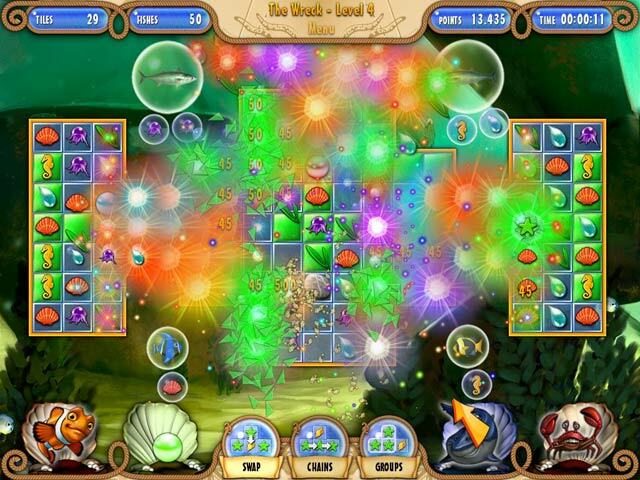 This is a bright colored, fast playing Match 3 that is very fun. There's not much of a story but I prefer Match 3s not to have one. Basically you are saving sea creatures and cleaning up the ocean. The power ups are easy to charge up and the boards are easy to clear. You can change from swap to chain to group during gameplay, which I really like. I never find myself getting bored or frustrated during this great little game. 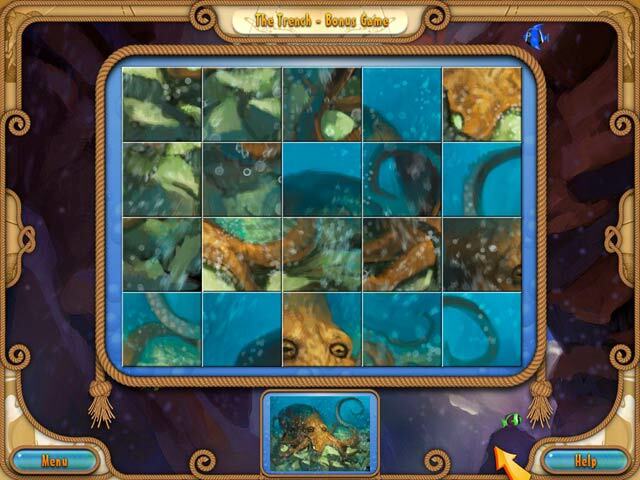 This is a fast paced match 3 with beautiful graphics, a great soundtrack and a cute little story of saving sealife behind it. You can play 3 ways: swap, chains and groups and you can change play anytime you want even if it is in the middle of a game. I love fishie games but after a while, they all start to look the same. This one was no exception, in fact it seemed a bit plainer than the others. It takes a while to get to an achievement, and it feels it was not worth it. Freeing the fish caught in the bubbles besides the board is a nice idea tho. Quite varied and entertaining Match 3. Ecological nice story: a ship spills oil into the sea, polluting and poisoning the water, killing or imprisoning sea creatures.You will help cleaning the sea water, saving the creatures trapped in the oil, ie healing the underwater world. Gorgeous graphics, very colorful and crisp . Good sound. Three game modes: Swap (rows of 3 or more), Chain (drag the mouse for 3 or more) and Group (just click on 3 or more). According score, gets help: a clownfish (destroy one tile), octopus (destroys all octopus of the board), a shark (destroys an area) and a crab. 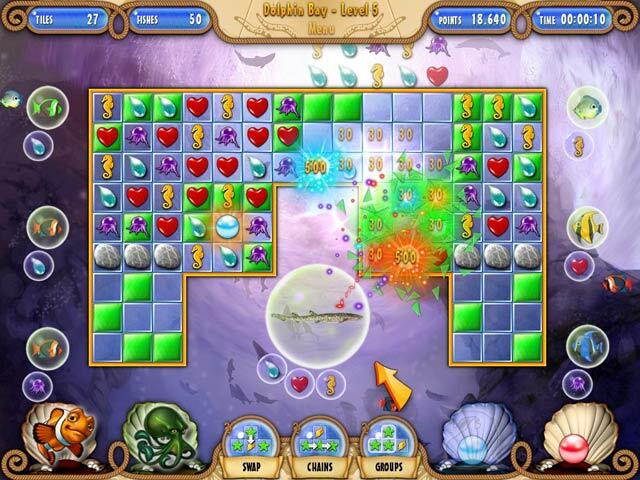 Also on board, come up bombs (which destroy tiles around). Do not forget to collect pearls to punctuate and unlock extras. While this game does have a timer, it's just there to inform you as to the length of time it took you to finish the level. I did not give this game a higher rating because the cursor moves slowly, the falling of the objects move slowly, and the overall feeling of this game is -- don't play this game while tired as you'll fall asleep -- which is a real shame as the graphics are great. I REALLY like the objects encased under the fish present as these indicate what objects have to be removed to "heal" the sick fishies; in essence, REAL goals to achieve rather than just clicking away at the Match3 board to just clear tiles. The BEST part of this game is that you can switch modes of play WHILE PLAYING A LEVEL between swap, group, and chains. It makes the gameplay really fun and FAR LESS frustrating than some of the other Match3 games I play.